Schriftsteller (1917-1993). Collection of 18 (2 autogr. and 16 typed) letters and cards. Malta, New York, Princeton und Monaco. Zusammen 15½ SS. auf 19 Bll. Verschiedene Formate. Mit einigen Beilagen (s. u.). Considerable correspondence with Siv Lind from Helsinki (1), Tuula Wikander (1), Sally Davis (1), one Leo (1), one Mrs. Stahl (1), the Italian publicist Rolando Pieraccini (2), and the American literary scholar Robert DeMaria (11). 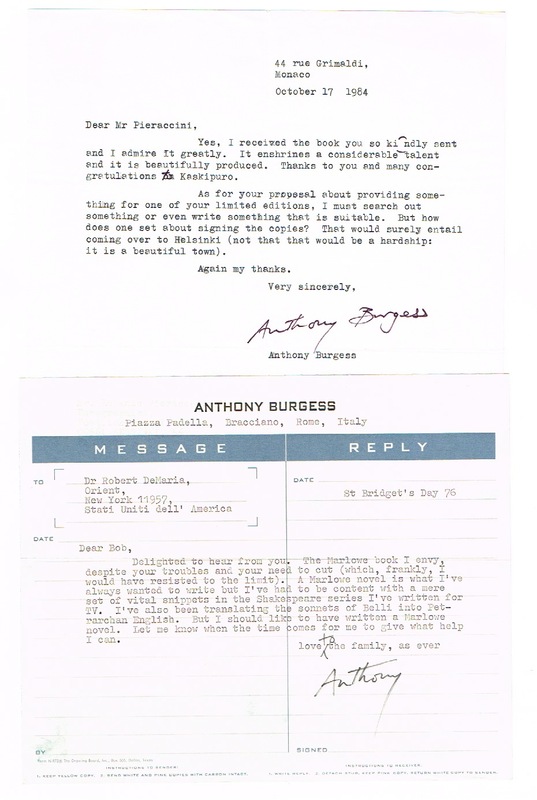 In addition to reporting from his own work (mostly in the letters written to DeMaria), Burgess’s letter to one Mrs. Stahl comprises his very personal opinion of the Nobel prize: „[...] My views on the Nobel Prize are simple and have more to do with economic need then with literary merit. I think I deserve it, for instance, because I think I deserve to have some kind of financial reward for working so hard. I doubt if there is a serious nexus between the Prize and genuine literary achievement: politics always comes into it somewhere, or else something celebratory – I don’t think Saul Bellow would have got it had it not been for America’s bicentenary; I don’t think Patrick White would have got it had it not been for the need to recognise the existence of Australia. If the Prize recognised genuine merit, the writers now dead who should have received it are: James Joyce, Vladimir Nabokov, Ronald Firbank, Ford Madox Ford, Franz Kafka, Hoffmannsthal [! ], Cocteau, D. H. Lawrence, Evelyn Waugh [...]“ (August 27, 1977). 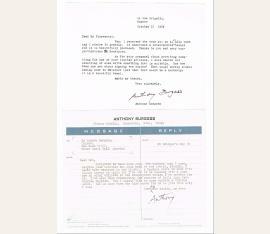 – Together with 4 typed letters of response from Robert DeMaria (6 ff.) and 7 ff. from Burgess’s adaption of Edmond de Rostand’s „Cyrano de Bergerac“ (typescript with some small autograph remarks)..